Phil Booth embraces fellow senior Eric Paschall in the final moments of Villanova's loss to Purdue on Saturday. HARTFORD, Conn. – The XL Center scoreboard clock read 57.6 seconds when Phil Booth left the court in a Villanova uniform for the last time and walked into the arms of head coach Jay Wright. Eric Paschall quickly followed his fellow senior and captain, as Wright embraced him, as well. On a night when Wildcats fans had very little to cheer about Saturday during a humbling 87-61 loss to Purdue that knocked the defending national champions out of the NCAA Tournament, they saved their loudest and longest cheers for the two leaders. Booth and Paschall are major reasons why Villanova won 26 games and captured its third straight Big East Tournament championship after taking the regular-season title for the fifth time in the last six years. They finished 1-2 in scoring, with Booth averaging 18.6 points and Paschall 16.5, and accounted for nearly 48 percent of the Wildcats’ offense. But there was much more to their contribution besides statistics. They led their young teammates on and off the court. Wright explained it best following the Wildcats’ 74-72 win over Seton Hall in the Big East Tournament title contest. “They really have been like coaches this season,” he said. “We can do so much on the court, but they’ve got to take guys in the locker room and teach them how they prepare for practice, how they prepare for games. They’ve got to teach them how to sleep at night, how to eat the right way. They’ve been like big brothers, fathers almost to these guys. However, the season went just two games longer before Booth and Paschall had to exit. At Saturday night’s postgame news conference, Paschall became emotional, dabbing his eyes with a towel, as he explained what it meant to play the last three seasons for the Wildcats after transferring from Fordham. Eric Paschall (center) wipes away a tear during Villanova's postgame news conference after the Wildcats lost to Purdue on Saturday. Outside his locker room about 45 minutes after the game ended, Wright said he felt Paschall’s sadness. Phil Booth, left, and Eric Paschall of Villanova in the locker room following their loss to Purdue in the 2nd round NCAA Tournament game at the XL Center in Hartford, CT on March 23, 2019. During five years in the program, Booth starred in the 2016 national championship game as a sophomore, scoring 20 points in the dramatic win over North Carolina. He sat out the following season with a knee injury, but came back strong, helping the Cats to a second title in 2018. 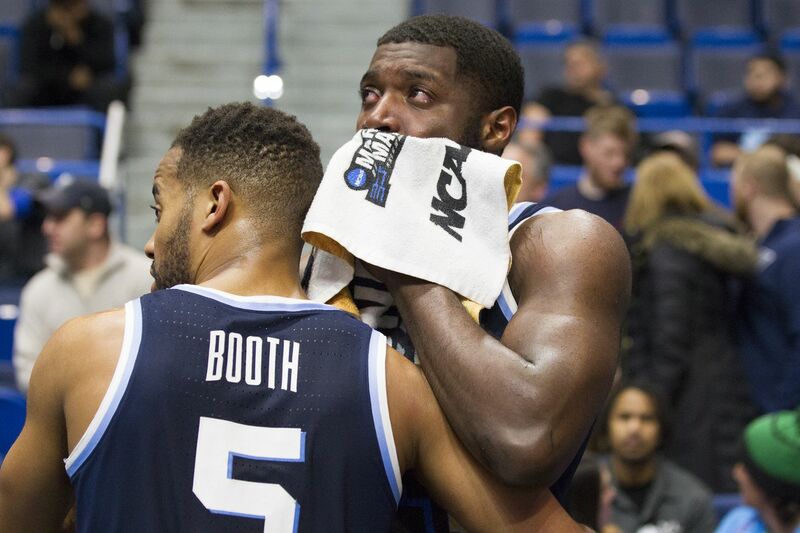 Certainly, fans of Booth and Paschall would rather have seen their careers conclude in anything but a 26-point blowout, the worst loss in Villanova’s NCAA Tournament history. But Wright noted his team had been on the other side in Final Four semifinal routs of Oklahoma in 2016 and Kansas a year ago.